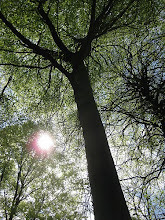 We are lucky in living near to the semi natural ancient woodland of Coaley Wood and the footpath through the wood passes this coppiced beech tree which has been recently recorded as an ancient tree. This tree has stood on this spot for hundreds of years and has survived because it has been coppiced or cut down for timber and allowed to regrow from the original stump. The adjacent has been quarried for stone and the roots of the tree undermined somewhat but the tree has survived with six stems from the old trunk.